Finding joy in the little moments. . . inside and outside of the classroom. Been awhile since I have added anything to my blog. I have found the way back to writing through Kate Messner's online writing camp, Teachers Write. I am challenging myself to participate every day. As a girl, I wrote all of the time. In college, I dreamed of one day writing a book. But, as life got in the way, my dreams and hopes were set aside to take on new roles and challenges. I realize (once again) that writing is my way back, my reinvention. Writing allows me to explore who I am, who I once was, and who I want to be. It helps me probe my deepest thoughts, unbury emotions and memories inside, and connects me with a community of other writers. I just finished my first assignment, a quick write about a place, describing it using sensory details. My mind drifted back to my girlhood home in Oakwood Village (small town Ohio) on Garden Road. I spent every waking moment of the summer racing around the dead end street (they weren't called cul-de-sacs back then), running through the woods with my sister and my neighbors, and imagining. I can still taste the sweetness of the sun-warmed blackberries and the tartness of the hand picked apples from our trees on my tongue. The more I wrote, the more I remembered the childhood I lived--and glimpsed the carefree imaginings of the childhood I want my kids to remember when they look back. I didn't realize how powerful a few lines could become. . . . As my pen flitted across the blank page, I began sketching, annotating all of the hidden places in our yard and the accompanying memories. And, so I sit here in the Quiet Room at the library, wrapped in a blanket of memories. Today, I promise to devote at least 15 minutes a day to reclaiming my writing life. I have asked my six year old son to join me. He was an avid writer in his kindergarten journal. We have decided to write together. Together we will sit in our dining room or curled on our green couch with our Writer's Notebooks and write. Looking back through my month of slicing, I see the patches of events and feelings that make up the multi-colored quilt of March. All captured in my words, frozen in time forever. My family celebrated another year in the life of one family member and said goodbye to another. We reveled in another day of life with sunshine and rainbows and clung tightly to one another through rain and thunder. I reflected on great loves in my life and mourned lost opportunities. And, within the walls of my classroom, we all learned more about living the life of a writer and realized how our words and actions define us. Ultimately they reflect who we are and who we wish to become. Living the life of a writer has helped me to gain insight into my students. I now remember how hard it is to just write. But, it pushed me to dig deep inside and find what was really important to me. I can also see that the words I capture on paper define who I am for the fleeting amounts of time it takes me to compose. I can redefine myself with just a few keystrokes. Most importantly, I was reminded that, like life, writing is hard. But essential. I found stories everywhere, and I discovered that I was experiencing the moments more deeply. I was seeing the world around me through the lens of a writer. And, I can say that I don't remember feeling more alive than I did this month. Who knew that a simple blog with black and white words marching across the pages could become my lifeline to living more deeply and fully? Let's celebrate a month of slicing with our old friend March, and welcome in our new friend, April. Oh, and see ya on Tuesday, slicers. Why is it so hard to be sick? Three a. m., my ears popped with pain, my throat felt like sandpaper, and my teeth were cracking under sinus pressure. I breathed a sigh of relief when I realized I had sub plans sitting on my desk, as I was planning to attend a district-level assessment writing meeting. I wanted to go badly, but my body was telling me to stay home. Like any teacher, I fought the idea that my body was telling me to slow down and rest. I surrendered to my illness, and climbed back in bed. After I woke up from my drug-induced morning nap, I scrambled, realizing I needed to make contact with several people at school. I needed to write our class newsletter, send it to a colleague to copy and distribute to my kiddoes, and still manage to formulate lesson plans for next week. Mentally, I began making list after list of tasks I needed to tend to on Monday. I was struggling to let go of my teacher mentality, even though I was ill. Sometimes, though, the teacher must refuel and recharge. We are human, we get sick, and life will still go on within the four walls of our classrooms. Teaching is a career in which you need to be present at all times, physically and mentally. When you can't be there physically, you are still required to show up mentally. We have obligations to create sub plans and continue parent and school contact during an absence. But, mostly, the heavy mental lifting comes in worrying about how the kids would be with a different teacher. That's not to say they weren't going to be fine in my absence, but I'm a teacher. Concern for the kiddoes is always on my mind. I am going to attempt to shut off my computer and my brain and take a nap. Lesson plans can wait. The kids can wait. But, I'm betting I will still see them in my dreams. . . . I was a woman on a mission this morning. I held my breath as I rolled out of bed, careful not to wake the sleeping babe beside me. The sun was barely peeking over the horizon when I tip-toed downstairs. Quietly, I opened the pantry doors in slooooooow motion, careful to avoid a creak. Like a heat-seeking missile, my eyes zeroed in on my bounty--the last gluten/dairy-free brownie in the Traber household. It was going to be a GREAT day! It should come as no surprise to anyone that I dreamt of said brownie all night. Seriously. I've documented my food struggles in an earlier post with becoming gluten/dairy-free. The biggest challenge is the availability of tasty chocolate treats on my diet plan. I can't just grab a handful of M & M's or a Snickers when a craving hits. Plus, gluten/dairy free treats are not so easy to find. Many of the snacks taste like someone mixed in a bucket of sand after he/she threw up in the ingredients. But, my problems were solved once I discovered the secret gluten/dairy-free snack case tucked away in the back of our grocery store. After buying one of everything to sample (and emptying my wallet in the process), I realized that I could still feed my chocolate addiction AND actually enjoy myself. Life no longer seemed bleak in the sweet department. Each grocery store trip, I purchase a few treats for the week, and I ration them out carefully. Many days, my mood is defined by these decadent little slices of heaven. And, let's be really honest--I hate to share them. My kids certainly don't appreciate my treats. My husband has a freezer full of Girl Scout cookies he can enjoy. Why would I share MY special (and pricey) snacks with my family? They can eat anything they want! Last night, my thoughts focused solely on the lone brownie. At one point during the night, I swear I woke up salivating. I fell back asleep, telling myself it was ridiculous for a grown woman to dream of brownies. Plus, eating one right now would mean I would need to brush my teeth again, and I was just too tired for that. I woke up a few more times, looked at the glaring red numbers on the clock, and rolled over, knowing it was still an inappropriate time to get up and feed the monster inside of me. Finally, I could stave off my craving no longer. I decided it was time to get up for the day (I had plenty of schoolwork I could do). Off I snuck downstairs to enjoy one small slice of chocolate heaven. Quickly my slice of heaven became my square of shame. When I heard my daughter's footsteps on the stairs, I shoved the rest of my coveted treat in my mouth as fast as I could. I almost choked. As I dusted crumbs off my lips, I pulled my daughter onto my lap. "Mommy, why you smell like chocolate?" I decided it was futile to argue with a three-year-old this early in the morning. I denied her accusations. Her eyes narrowed suspiciously, so I offered her the remote control. Satisfied, she dropped the subject. "Shame, shame, I know your name," my conscience whispered. The look in my daughter's eyes made me feel dirty, greedy, and shameful. Here I was, a grown woman, sneaking around before dawn to avoid sharing a brownie. No one ever told me shame had such a bitter taste. But, if it tastes like this, I'll take it. And, I'm not giving it a second thought. Let's just hope they don't catch me with a cupcake tomorrow morning. Little did my husband know when he walked in from work tonight that his heart would stop momentarily. A few words from me, and his eyes opened as wide as saucers, "the vein" popped out of the side of his head, and his mouth formed into a massive oval. I told him that we were going to Family Camp with our church in May. Once he discovered that tigers do not live in Ohio, our son, Eli, has been begging to go camping. But, my husband equates camping with having his eyes stabbed with hot pokers and has managed to redirect Eli's attentions to "more appropriate" (i. e., desirable for dad) activities. There's no getting out of it this time. To be fair, I must tell you that my husband's hatred of camping does NOT stem from a lack of physical abilities or stamina. I've often told my husband that he should audition for "Survivor." After all, he is supremely athletic, good at puzzles, and he keeps to himself, enough so that people would want him in an alliance. Plus, we could really use a million bucks. Then he reminds me of his addiction to toothpaste, soap, and a hot shower. He'd be the first to tell you that the outdoors aren't really his "thing." I'm pretty sure the closest he's been to "roughing it" since we've been together is when I've escaped for the occasional Girls' Weekend and he's been left to fend for himself with the two Traber animals. And, that did not involve bugs, tents, or latrines. Here's just one more reason why I love my husband--he is a good sport. He will go to Family Camp in May, and he won't complain. He will participate in each and every activity that Eli wants to. He'll pound a few hot dogs under the stars, roast a handful of marshmallows, and sing songs 'round the campfire. He'll swat at the swarms of mosquitoes that Ohio lovingly has to offer, and he may forego his shower if the facilities are not private enough. And, he'll do it all with a smile on his face. Not because he is enjoying himself, but because he knows his children are. That's how I know I'm one lucky woman. Family Camp, here come the Trabers. The last Wednesday of the month is a special day in the Traber household. A cleaning service comes and restores order and cleanliness to our home. The last Tuesday before the last Wednesday is also monumental. All four Trabers scramble to tidy up to make our home presentable. Which inevitably triggers the question, "Mommy, why do we have to clean the house before the cleaning lady comes?" And, each month, I give him the same answer: "We clean to make it easier for her." But, deep down, my face burns with shame. We tidy up the night before from a deep-rooted fear of allowing someone else to witness our day-to-day living. By the time the end of the month rolls around, our house resembles a war zone. I find myself sticking to syrup-drizzled chairs, dusting off shelves with the bottom of my t-shirt, and spraying Windex on the floor to kill the teeny little ants snacking on some food remnant. The garbage cans overflow, and tumbleweeds of cat hair blow across the hardwood in the hallway. But, the end is in sight. Tomorrow, my house will sparkle and shine. You can eat off of our floor and pretend you are in a hotel with the toilet paper triangles. The beds are made, and for a moment, our house looks like something out of a magazine. Quite a stark contrast to its usual state of disarray. But, once a month, I'll take it. His question also boils down to one simple fact: The cleaning service is what I like to affectionately term, "self-care." I always swore that as long as I was able-bodied, I would never hire someone to do a job I could do myself. Ridiculous, lazy, and extravagant, I thought. But, as a full-time working mom to two human wrecking balls, I find myself short on time and energy. The truth of the matter is I choose not to spend the all too precious moments with my family scrubbing toilets and shower doors. I'd rather cut a different line item out of our budget to reclaim some time with my kiddoes. I find it a rather smart investment. But, nothing changes the fact that I do not want anyone to bear witness to my poor housekeeping skills. So, we clean in an attempt to paint a rosy picture of the all-American family, organized, clean, and in control. We clean to hide the ugly truth--Mommy just hates to clean. Tonight, we will do our last-Tuesday-of-the-month dance. Toys will be shoved under beds and in closets, and piles of mail will be sorted. For tomorrow, the cleaning lady comes. My friend Donna's dog went to Dog Heaven today. Bailey was 15 years old. Donna cried as she told me on the phone. I cried back. I cried for Donna and her family and their loss of a loyal companion, and I cried with the knowledge that some day, I, too, will have to say goodbye to my beloved friend, Zoe. Zoe is my best friend, my confidant, my soul mate. And, yes, she has four legs, whiskers, and a tail. She purrs with perfection and makes my life complete. I've got a serious case of feline love. I come by my four-legged obsession genetically. Growing up in a pet-friendly household, we always had a few animals sharing our lives--fins, feathers, or fur. I have pictures of me as a toddler holding my new kitten, Bunky (named after Archie Bunker) in my lap. I had a parakeet who rode on my pink Barbie corvette (who was subsequently eaten by Bunky). Scores of others passed through our door, and all the while, I learned how to love and respect God's creatures. My heart began yearning for a pet after we bought our first house. Tim and I found Zoe at PetSmart when the Logan County Humane Society was offering cats for adoption. In stark contrast to the active little kittens, a soft gray ball of fur lay relaxed in the back of her cage. Her green eyes glowed, the color of a margarita on the rocks, and pierced the depths of my soul. The moment I held her in my arms, I was in love. An instant and endearing love of the feline type. Zoe nuzzled her bubble gum pink nose into my neck, claiming me as her human. After the required 24 hour waiting period, we picked her up the next day. The sign on her cage read, "DAWN," but the name did not seem fitting for such a magnificent work of art. She sparkled with life. From her gentle meows to her long eyelashes. We changed her name to Zoe, Greek meaning "life." Her middle name? Marilyn Knox after my grandma, a woman who loved cats more than life itself. Zoe Marilyn Knox Traber. A regal, royal name for my princess. Here we are, ten years later, and Zoe is truly a member of our family. She and I share a special bond--she was my first baby, even if I did not exactly birth her. She looks deep into my eyes, and I know she understands me. She seems to understand my unspoken emotions. I can be exactly who I am and feel exactly what I am feeling, and she loves me in spite of it. She holds my heart in her paws. 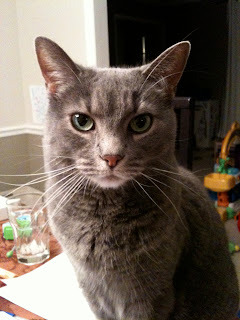 When I heard the news of sweet Bailey's passing, I was reminded that pet ownership is an act of faith. We pour our hearts and souls into creatures who, in all reality, will leave this earth before us. Yet, we can't help ourselves. We love and are loved in return, quite unconditionally. Animals teach us compassion and companionship in ways we can only imagine. They demand our hearts and give us theirs in return. While we gave Zoe Marilyn Knox Traber a home, she gives me boundless love and indescribable joy. Nothing in life can compare to sweet feline love.